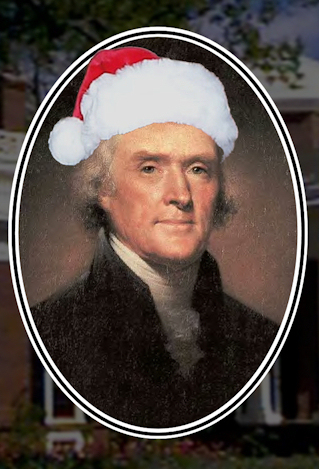 Did you know that Thomas Jefferson did not celebrate Christmas at the White House? Just imagine if Barak Obama restricted Christmas at the White House. I think he might be accused of ushering in a new era of secularism and debauchery. The America of Jefferson’s time was significantly different from the America of our time. The most “fundamentalist” religious people, the Puritans, rejected Christmas. For a time, much of the celebration surrounding Christmas was illegal in the northeast. Southern states such as Virginia (Jefferson’s home) were much more Anglican in regard to religion. They reflected the religious moderation brought about by Queen Elizabeth and King James, while the northern states (especially Massachusetts) were dominated by Calvinist Puritanism. The Anglican influenced states embraced Christmas and celebrated it in a variety of ways. The Puritan states saw Christmas as offensive. This is quite a contrast to today where the most fervently religious people often insist Christmas be recognized in every part of culture while the more secular minded insist that Christmas be avoided in public places. This look at history shows us that expressions of our faith change as culture changes. The issue that Christians in one era fight to the death for, might become irrelevant in another time. The true fundamentals of our faith do not change, but the secondary issues that we put importance on certainly do change. I am challenged to put my focus on the things that are truly important, and not to be too harsh with people who do not line up with my beliefs. While I agree that we don’t have to be argumentative about Christmas, I disagree that we should just ‘roll over and play dead.’ This is the major position of the Church (Catholic as in Universal) in many of the secular arenas where it once had a voice of morality and integrity. As soon as someone has pushed, it has backed off. The last ‘bastion’ of morality is the family and it is under attack. Maybe there are those of us who are demanding equality in the marketplace in regards to the historical nature of a secularized holiday and maybe we are unmoving in what seems like a simple thing, but that’s where we as a Church have traditionally given way and look at where we are. Something we thought would never be attacked is under open warfare even by the government who is supposed to represent the people. I would disagree that the issue that we, as Christians, are supposed to fight for tooth-n-nail doesn’t change with the ages, but rather the effectiveness and watering-down of the Gospel has caused errosion to the foundation that humans built when they decided they could do religion instead of God. I don’t believe that Jason wants us to rollover and play dead. I do believe that we often spend way too much energy and time fighting for somethings when we should be spending time winning the hearts of the unbeliever. Yes, there is a vast difference between rolling over and choosing our battles. Jesus’ example and directive was to help the helpless and bring the Kingdom of God wherever He went. The battle over Christmas is not often a Kingdom battle. I cannot imagine that Jesus would demand that a secular, consumerized culture recognize Him.